This tray has a diameter of 10 inches and a height of about 2 in. Contains an assortment of Salted Virginia Peanuts, Milk Chocolate Covered Peanuts, Yogurt Peanuts, Butter Toffee Peanuts, Wasabi Peanuts and Honey Roasted Peanuts. I can only rate customer service which was superb. I did not see what or if gift was delivered to this nursing home. Recipient unable to respond. I just trust it was delivered and appreciated. 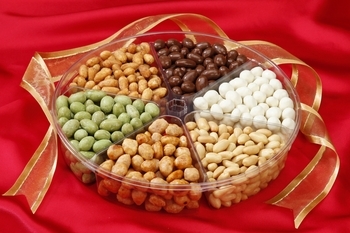 Because of weather, chocolate and yogurt peanuts could not be included without exhorbitsnt extra shipping charge. Had to make substitutions.